Also serving communities of Vandergrift, Leechburg. There are 5 Assisted Living Facilities in the Apollo area, with 3 in Apollo and 2 nearby. To help you with your search, browse the 3 reviews below for assisted living facilities in Apollo. On average, consumers rate assisted living in Apollo 5.0 out of 5 stars. Caring.com has helped thousands of families find high-quality senior care. To speak with one of our Family Advisors about assisted living options and costs in Apollo, call (855) 863-8283. Named in honor of the Greek god and spelled the same forward as backward, Apollo, PA, is a borough of Armstrong County where 16.7 percent of residents are age 65 or older. Seniors considering a move into assisted living in the Apollo area can choose from at least 24 different top-notch facilities, including three in Apollo and 21 in nearby communities such as Penn Hills, Monroeville and Cheswick. Licensed as assisted living residences (ALRs) or personal care homes (PCHs), these facilities provide room, board and assistance with daily activities to four or more adults. While services vary by facility and are tailored to the individual needs of each resident, ALRs provide nursing home or medical levels of care, while PCHs don't. Apollo’s climate tends to be cloudy and rainy, averaging 41 inches of rainfall and only 159 sunny days each year. According to the American Lung Association, which measures air quality indicators, Armstrong county receives a failing grade for ozone. This poor air quality may put residents’ health at risk and seniors with respiratory ailments may be at a higher risk than the general population. Apollo’s cost of living, at 20.8 percent less than the national average, makes it an attractive choice for budget-conscious seniors. In the state of Pennsylvania, retirement income, such as Social Security or income from a 401(k) or an IRA, is tax exempt. Pensions are also exempt for seniors over the age of 60. Unfortunately, at the time of writing, Apollo doesn’t offer a public transportation system. While some shops, doctors’ offices, pharmacies and banks may be within walking distance of assisted living facilities, the lack of public transit may make getting around town difficult for some seniors. For a small community, the Apollo area offers a surprisingly diverse art and culture scene, including shops, museums, wineries, historic sites, parks and community events. Assisted Living costs in Apollo start around $0 per month on average, while the nationwide average cost of assisted living is $4,000 per month, according to the latest figures from Genworth’s Cost of Care Survey. It’s important to note that assisted living rates in Apollo and the surrounding suburbs can vary widely based on factors such as location, the level of care needed, apartment size and the types of amenities offered at each community. Apollo and the surrounding area are home to numerous government agencies and non-profit organizations offering help for seniors searching for or currently residing in an assisted living community. These organizations can also provide assistance in a number of other eldercare services such as geriatric care management, elder law advice, estate planning, finding home care and health and wellness programs. To see a list of free assisted living resources in Apollo, please visit our Assisted Living in Pennsylvania page. Apollo-area assisted living communities must adhere to the comprehensive set of state laws and regulations that all assisted living communities in Pennsylvania are required to follow. 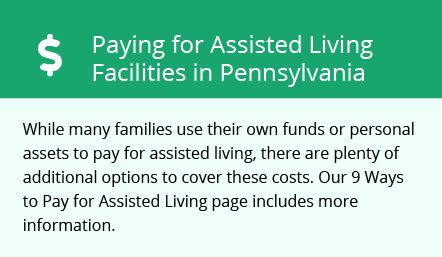 Visit our Assisted Living in Pennsylvania page for more information about these laws.